Cook pasta according to package directions, omitting any salt or fat. Meanwhile, heat 1 teaspoon canola oil in a large nonstick skillet over medium heat, tilting to coat bottom. Add chicken and cook 4 minutes or until slightly browned, stirring frequently. Add artichokes and cook, stirring constantly, 2 minutes or until chicken is no longer pink in the center and juices run clear. Transfer to a plate and set aside. Add remaining canola oil and garlic to skillet, and cook 15 seconds over medium heat. Remove from heat; add drained pasta, chicken mixture, spinach, basil, and salt. Toss gently, yet thoroughly, to blend. Sprinkle with Parmesan. Makes 4 (1 1/4 cup) servings. Tip: Adding the spinach leaves and basil at the very end allows the leaves to wilt slightly while retaining their vibrant color and flavor. 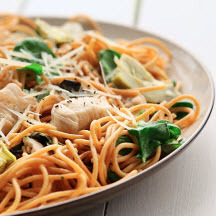 Nutritional Information Per Serving (1/4 of recipe; 1 1/4 cups) using 3 pounds boneless, skinless chicken breasts: Calories 310; Total Fat 12g; Saturated Fat 2g; Cholesterol 55mg; Sodium 370mg; Carbohydrates 24g; Fiber 4g; Protein 26g. Recipe and photograph courtesy of "The Heart-Smart Diabetes Kitchen: Fresh, Fast and Flavorful Recipes Made with Canola Oil" from the American Diabetes Association and CanolaInfo.